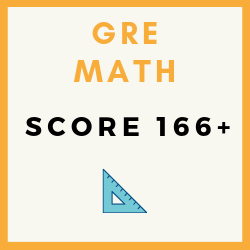 How to score 166 in GRE Mathematics? The GRE Quant Section tests fundamental mathematics skills, the capability to grasp and interpret data from charts, and the ability to apply logical skills to solve problems. With a little practice, hard work and patience you can get a perfect score. Understanding the number family such as prime, positive, negative, even and odd numbers is the key to scoring in Arithmetics. Familiarity with elementary mathematics such as ratios, decimals, percentage, probability, etc. could be established through preparative materials such as Kaplan's Maths Guide and workbooks. The various rules associated with logical reasoning could be written down and reviewed periodically as logical reasoning always has the upper hand in solving these problems more efficiently when compared to formulas. Practice should be initiated with simple questions followed by challenging problems. Be patient, for many students mathematics is the easiest section, but silly mistakes can make a dent in the score. Use your time (understand the language) go through all answer choices. Basic algebra concentrates on variable manipulations and simplifying equations. Scratch paper must be used to solve these problems rather than attempting to solve them in your head. This technique avoids confusion and increases speed. Changing signs are the areas of common mistakes to look out for in Algebra. Continuous practice and clear understanding of concepts resolve these problems. You could begin by mastering primary planar geometry involving lines, angles, and basic shapes. Geometric formulas for basic calculations should be memorized. Diagrams must always be constructed for these types of questions. Illustrations are always a shortcut to solving geometry problems efficiently in lesser time than required. Data Analysis includes questions from statistics involving mean, median, mode, frequency distributions, charts, tables, and graphs. Tackling these questions begin with scanning through the presented data to get a fundamental idea and focusing only on the conditions required for answering the questions. It is mandatory to keep an eye open to characteristics such as axes of graphs, units of measurements and orders of magnitude to avoid standard conversion errors. More the practice, better are the chances of scoring in these questions. Practice, practice, and more practice is the only way to achieve perfection. Sample tests must be continuously taken to get acquainted with the question types and the time that you could afford to spend over each. Keep tracking your tests for the questions which you get wrong, spend more time practicing those questions. Scratch paper must be used to minimize errors and to avoid confusion. Good sleep is essential for proper brain functioning and reducing panic attacks. Eat a healthy diet and exercise regularly to keep your brain sharp and fit and active. You can easily score high on the GRE Quantative section, but you must be willing to put in the effort necessary. Mathematics questions are easy for most students from STEM background but patience is necessary, you won't get extra points if you finish fast. Go through all answer choices even if you know the answer. Sometimes you may interpret question differently.